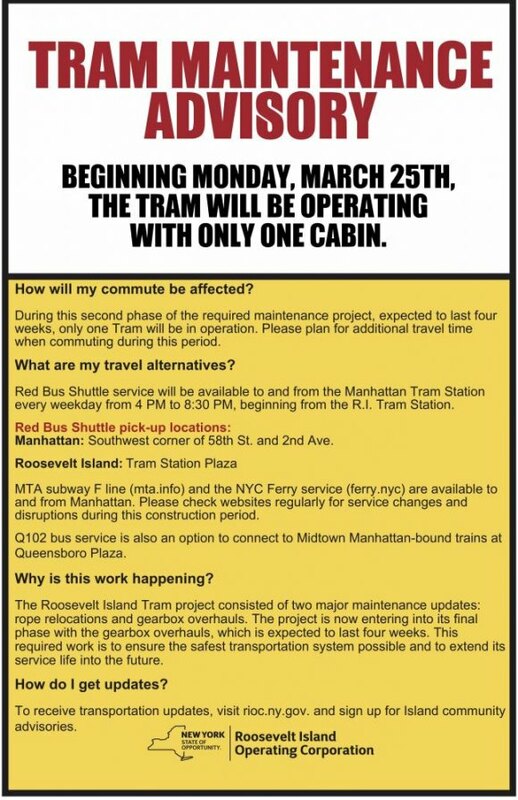 Not withstanding that RIOC, the communications-troubled State agency protected by Governor Cuomo, never managed to alert the community that Tram operations returned to normal, last week, their brain trust has now announced new single cabin restrictions, starting Monday, March 25th. Please be advised that starting Monday, March 25th, the Tram will be operating with only one cabin in service. This work is expected to last up to four weeks, alternating between the North and South cabins. The Tram entry/exit patterns, elevator service, and MetroCard machine availability will not be affected. Given that some Tram maintenance was expected, it's not clear why several prior advisories were poorly timed or not distributed. This time around, frail, elderly and physically challenged are assured that RIOC's attention to their needs has been reduced even further. "Red Bus Shuttle service will be available to and from the Manhattan Tram Station every weekday from 4 PM to 8:30 PM, beginning from the R.I. Tram Station," the advisory said. What it didn't say is that, if you need special consideration outside weekday evening rush - that is, anytime in the morning, late at night or on weekends - you can count on RIOC for even less support than before. And as some have speculated, RIOC may be exercising cheapskate tendencies toward any group unlikely to contribute to Cuomo campaigns by diverting a normal rush hour bus in the evening to make the shuttle runs, rather than putting an extra vehicle in play. This means excess crowding on fewer buses as well as gaps in service along the Main Street circuit.